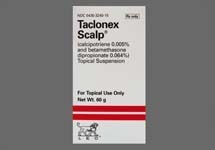 Taclonex contains a combination of betamethasone and calcipotriene. Betamethasone is a topical corticosteroid. It reduces swelling, relieves itching, and constricts blood vessels. Calcipotriene is a form of vitamin D. It works by decreasing the rate of skin cell reproduction. Taclonex is used to treat psoriasis vulgaris. 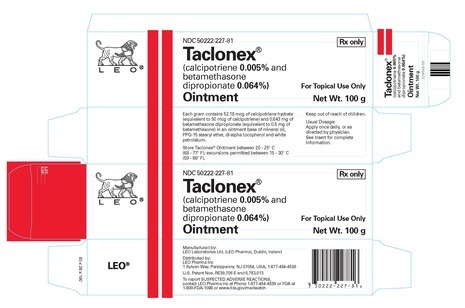 Taclonex ointment is used on the skin to treat psoriasis in adults. It contains a strong corticosteroid (betamethasone) and a drug that is somewhat similar to vitamin D (calcipotriene hydrate). Psoriasis was identified as a disorder, affecting human skin, many centuries ago. Since then doctors are trying hard to find solution for the skin problem, called psoriasis. Though people have not still discovered the complete cure for psoriasis, modern science of pharmaceutics, standing on the fundament of knowledge and experience gained throughout the whole human evolution, and being armed with the most up-to-date technologies and inventions, continues to develop newer, safer, and more effective medications against psoriasis. This is what they say about Taclonex, one of the recently approved options for treating psoriasis, - it is fast, it is effective, it is simple and there is nothing like it. Well, let’s look closer at Taclonex and check out whether the above mentioned statements are nothing but an advertising slogan, or the medication really possesses all the benefits. Taclonex, in fact, is the combination of two medicines - betamethasone and calcipotriene, which were previously used separately in the treatment of psoriasis. Betamethasone belongs to the group of topical corticosteroids, which help to reduce symptoms of skin inflammation, such as itching and swelling. Calcipotriene is one of the forms of Vitamin D. This component works by decreasing the rate of skin cells reproduction. Dovonex (calcipotriene) for psoriasis has been available for over a decade. Altough effective for some patients, the drug is notoriously slow in achieving clearing of psoriasis. Almost as soon as it was released, doctors were using it in combination with corticosteroid creams to help speed up results. One difficulty with these combinations is that the calcipotriene ingredient was not stable at the same pH as the corticosteroid ingredient, hence applying both creams together reduced the effectiveness. This necessitated in all sorts of treatment schedules such as Dovonex weekdays and corticosteroid creams weekends or Dovonex in the morning and corticosteroid creams at night. The stability problem has been overcome and now both drugs have been combined into a single, once-daily ointment called Taclonex.